(Rick Egan | The Salt Lake Tribune) Uri Sarig and Meghan Schwob with AmeriCorps, remove a kitchen counter for UDOT and Habitat for Humanity from a home that will be demolished for freeway widening, for use in Habitat for Humanity homes, Wednesday, Jan. 16, 2019. (Rick Egan | The Salt Lake Tribune) Tierra Pouttu-Clarke with AmeriCorps, removes a closet door for UDOT and Habitat for Humanity, from a home that will be demolished for freeway widening, for use in Habitat for Humanity homes, Wednesday, Jan. 16, 2019. (Rick Egan | The Salt Lake Tribune) Tierra Pouttu-Clarke and Taylor Drake from AmeriCorps, removes a closet door from a home that will be demolished for freeway widening, for UDOT and Habitat for Humanity, Wednesday, Jan. 16, 2019. (Rick Egan | The Salt Lake Tribune) Tierra Pouttu-Clarke and Taylor Drake from AmeriCorps, removes a closet door from a home that will be demolished for freeway widening, for UDOT and Habitat for Humanity, Wednesday, Jan. 16, 2019. (Rick Egan | The Salt Lake Tribune) Abby Chiesa removes a closet door from a home that will be demolished for freeway widening, for UDOT and Habitat for Humanity, Wednesday, Jan. 16, 2019. (Rick Egan | The Salt Lake Tribune) Abby Chiesa removes a closet door from a home that will be demolished for freeway widening, for UDOT and Habitat for Humanity, Wednesday, Jan. 16, 2019. (Rick Egan | The Salt Lake Tribune) Meghan Schwob and Alex Elliott remove light fixtures from a home that will be demolished for freeway widening, for UDOT and Habitat for Humanity, Wednesday, Jan. 16, 2019. (Rick Egan | The Salt Lake Tribune) Tierra Pouttu-Clarke and Taylor Drake from AmeriCorps, removes a closet door from a home that will be demolished for freeway widening, for UDOT and Habitat for Humanity, Wednesday, Jan. 16, 2019. (Rick Egan | The Salt Lake Tribune) Uri Sarig and Jeremiah Jenkins from AmeriCorps, removes a the kitchen sink from a home that will be demolished for freeway widening, for UDOT and Habitat for Humanity, Wednesday, Jan. 16, 2019. It’s akin to organ donation by homes that are about to perish. To help Habitat for Humanity afford to build other housing for low-income people, volunteers are salvaging usable materials from 27 now-vacant homes in Midvale that the Utah Department of Transportation bought to demolish in clearing way for Interstate 15 widening. UDOT agreed, and Habitat for Humanity has been doing that now for six years. It has salvaged materials from 130 homes so far, not counting the 27 it is now working on. Blake said some of materials go to homes that the group builds itself. But most are sold at the Habitat for Humanity ReStore at 1276 S. 500 West in Salt Lake City, where contractors, businesses and others also donate products that are sold at discount prices. So volunteers carefully package up entire kitchens, shrink wrap material, put it on a pallet and sell everything, including, literally, the kitchen sink. “They may sell for $500, and they sell like crazy, actually,” he said. Volunteers also remove doors, windows, lighting fixtures and anything that may be of use. “Some appliances are usually also in the houses, and we take and sell them,” he said. Blake notes that an aunt and uncle of his once lived in one of the houses now being salvaged. “So I’m glad we can save what we can,” he said. “This keeps 681 tons of refuse out of the landfill every year” besides helping the nonprofit and low-income Utahns. Neighbors of the vacated homes in Midvale complained earlier this year that the agency was taking too long to demolish the homes, and said that allowed drug users and others to squat in the homes, increasing graffiti, vandalism and crime in the area. 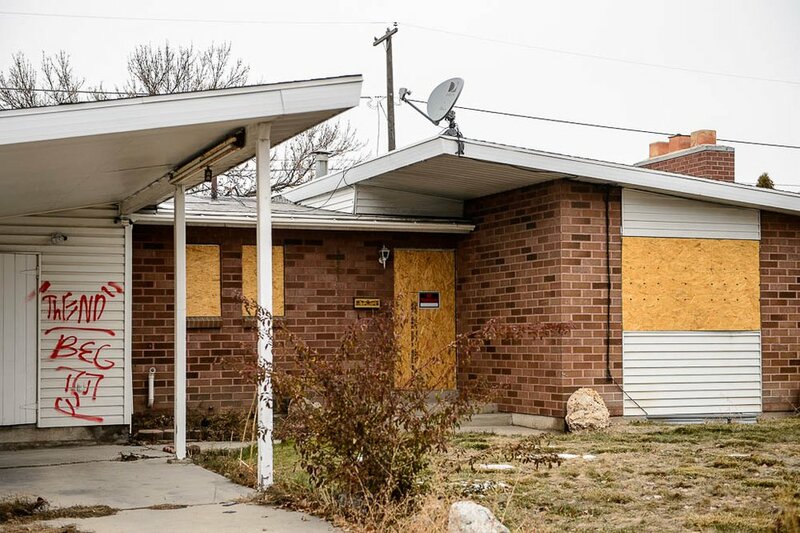 (Trent Nelson | The Salt Lake Tribune) UDOT is buying 49 homes in Midvale to widen I-15, and 24 are vacant. The neighborhood is having trouble with homeless people breaking in and trying to squat there. UDOT promises to start demolition next week. Tuesday Dec. 11, 2018. Gleason said UDOT is moving as quickly as it can to demolish homes once it acquires them — but it takes up to 90 days to obtain needed permits, properly shut off utilities and remove hazardous materials such as asbestos. Working with Habitat for Humanity does not cause any further delays, Gleason said. UDOT can demolish only about three homes per week, giving the nonprofit time to salvage materials before that. “Sometimes we’ve been in there just 45 minutes before the bulldozer,” Blake said.